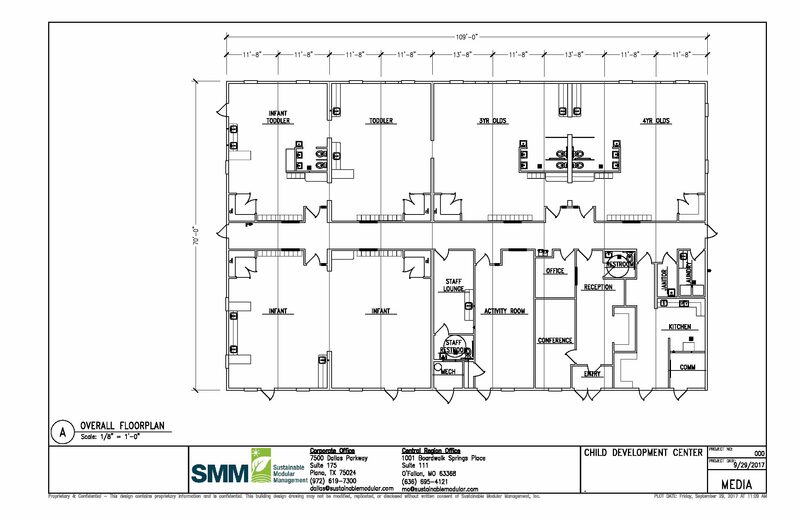 Child Development Center Building | Sustainable Modular Management Inc. The center is an approximately 7,600-square-foot Child Development Center modular building designed and built to serve children of various ages. The complex includes 1,300 square feet of care space for infants, 1,300 square feet of care space for toddlers, and 1,800 square feet of care space for 3 and 4-year-olds. The facility incorporates an activity room, conference room, reception area, kitchen, offices, laundry facilities, staff lounge and age-appropriate restroom fixtures.